Performance Improvement 2013-2014. What Is the Current State of the Literature on Dissemination of Research in Human Services and How Can the Existing Knowledge Best Be Applied? This project reviewed and synthesized relevant research on best practices in human services research dissemination, drawing on multiple fields, including but not limited to public health, communications, sociology, business management, and library and information science. 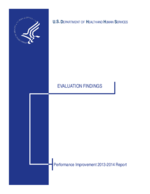 The review informed the development of a framework integrating the most effective (or promising) methods for disseminating information on research, evaluation, and evidence-based practices to multiple stakeholders including program offices, policymakers, practitioners, researchers, and training/technical assistance providers. Common strategies for successful dissemination included: understanding audiences and their needs and desires; using multiple media to establish links with audiences, particularly through trusted sources and networks; establishing the relevance and applicability of research to audience needs; crafting messages in styles and formats that will appeal to audiences; applying strategies to bridge disciplinary boundaries; addressing issues of situational fit throughout the process of producing research; and emphasizing follow-through and ongoing communication. Based on conversations with key audience members, the project team adapted these lessons into dissemination plans.